I've started on a version of this post several times, but for some reason it never comes out right and either abandon it before posting or delete it soon after. I'm not sure why. There's a joke that gets made in Rome, that Rome is the 'deposit of faith.' That is to say that one arrives in Rome with faith, or at least because of the faith, but that living and working in Rome causes one to lose the faith. Thus, when one leaves Rome, the faith is left behind, 'deposited' there. Over the years the parable of the weeds in the field, which we had in the lectionary as the parable itself (Matthew 13:24-30) this past Saturday and then again today as the 'in-house' explanation given to the disciples (13:36-43), has become for me one of Jesus' most comforting words. For as the world is populated by the children of the Kingdom and the children of the evil one, so we ourselves are like the field where weeds have been sown along with the wheat. And, as the master of the field says, the way they are tangled together--at the roots, presumably--makes it hard to simply pull up the weeds and be rid of them without also compromising the growth of the wheat. In other words, it's not like our holiness and our sinfulness, our good points and our pitfalls, our gifts and our flaws are such discrete and separate things. As individual created persons, we are a unity. Like the tangled roots of the wheat and weeds, so the goodness and evil in each of us. For example, the temperament that makes someone patient might at other times make him passive. The gift of caring for others can turn into the need to be needed. The desire for righteousness and justice can edge into intolerance and a frustrated zeal for the reform of others. At the very core of the human being is the desire of the heart to go out of itself, to lose itself and thus find freedom in loving another. Indeed, this is the very engine of prayer, as we strive in prayer to open ourselves to the Other whom our hearts most desire. But too often this basic spiritual energy gets lazy and settles for less than its genuine object, God, and lets itself be corrupted into lust, or worse, the dirtier modalities of lust such as possessiveness or the drive to control or use others. There's a debilitating frustration that can creep into the practice of a devout life, as we start to despair, in little, secret ways, of being rid of the weeds that choke our spirit and keep us--and those around us--suffering. As we grow in holiness and devotion, we might also feel like we are 'growing in sin' at the same time, as the roots seem to get more and more tangled. We want to pull up the weeds in one grand gesture, one confession made especially well, one very devout retreat. But it just can't happen like that. The roots of the weeds are tangled with the roots of our goodness, of our preciousness to God. To uproot the weeds without ruining the growth of the wheat takes time and patience. God is so good and so delightful that we want to run with him. But his invitation is to walk. Perhaps others with experience of religious life will feel some resonance when I say that one of the ordinary and persistent trials of religious life is finding out that one's expectations of it and presumptions about it are unfounded and erroneous, respectively. My originary and archetypal experience in this regard came a few days into my first postulancy, when, in my innocence, I asked of one of the directors when I would be told which of the priests was to be my confessor. For better or for worse, the sort of lives of the saints that had formed my idea of religious life had made me think, among other things, that being assigned a confessor would be one of the important first moments of my religious life. Instead, I was informed that it was the policy of the formation program that whatever had been the individual postulant's use (or lack thereof) of the sacrament of Reconciliation prior to entering, he ought to continue it quietly. At the time, this left me not only scandalized but also with the nagging feeling that religious life was not going to provide me, as I had presumed it would, with the structures and resources for living what seemed to me to be a religious life. Why should I be concerned about this? Well, it has to do with another word we have from St. Francis, in his Testament. The question of the legislative weight of the Testament is an ancient and abiding one in Franciscan history. The problem derives from St. Francis himself, who says in the document itself that it is not 'another Rule' but at the same time seems to make commands by obedience. The Capuchin branch of the Friars Minor, of which I find myself a member at this stage of my Franciscan journey, has always maintained as one of its characteristics the tradition of holding up some of the alleged precepts of the Testament and cherishing it as the primary gloss on the Rule. The Lord of Ostia mentioned here is, of course, that famous character of early Franciscan history, Cardinal Ugolino dei Conti di Segni, Cardinal Protector of the Order and the future Pope Gregory IX. Therefore, one of the comforts I had always felt as a Capuchin, in this branch of the Order said to hold the precepts of the Testament dear, was that if it happened that I abandoned the Divine Office or somehow began to deviate from the Catholic faith, my ministers would put me in chains and deliver me to the Cardinal Protector of the Order for correction and, I imagined, some kind of remedy. But if there is no longer any such person, I now realize that my comfort was in vain. If however, one wanted to do his best nonetheless and deliver me to the Lord of Ostia, that wouldn't be so simple either. Depending on how one wanted to read the intervening history of the Roman Church and her suburbicarian sees, it might mean delivering me either to Cardinal Angelo Sodano, Dean of the College of Cardinals, or to Bishop Vincenzo Apicella, the latter being, incidentally, the bishop of our blogging colleague Fr. Z. But I leave that discernment up to my superiors, may God forbid that it ever be necessary. More and more over the years, I turn to Mary Magdalene's encounter with the Risen Lord as both a means to understand prayer and a model for praying. I've written the same stuff before, but instead of linking some old post I thought to make a new one in the 'theses' style. Stay still, stay where you are inside. Don't get up and do something else either physically or interiorly at the first thought of doing so, even when others have run away. Even when all you have inside seems like emptiness, look into it. Whatever question or concern or hurt happens to be on your heart, address it simply to whatever presence seems to be there, whether you recognize the presence or not, whether it seems like anything or not. Know that when you recognize the presence of God, this is how we, in our limited perception, experience God recognizing and calling to us. So like many aspects of prayer--and indeed, prayer itself--things feel like our action and our perception when in fact they are the action of the Holy Spirit praying within us. This is a sort of optical illusion of the interior vision that happens because of our being limited to time and space. Accept without discouragement that the experience of God in prayer feels fleeting. It feels this way because God is not a 'thing' that can be possessed like our other created experiences and still less like a physical, temporal good. In this sense prayer is the first and primary school of evangelical poverty, because the object of our desire cannot be grasped and possessed. Prayer trains us in letting go, because we have no choice with God but to let go. 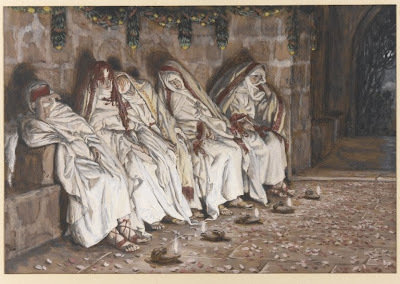 Further, even if it seems as if God flees from us in prayer, he is not fleeing in order to be rid of us, but as a way of drawing us, seducing us even, deeper into the mystery, that we may begin again with an even more profound gaze into the empty tomb. The fruit of prayer is witness to and announcement of the Resurrection, that the world may know that the new creation has begun to arrive. By giving us Abraham's mysterious encounter with the three men (Genesis 18: 1-10a) as the first reading, the liturgy today sets us up to interpret the gospel of Martha and Mary of Bethany (Luke 10: 38-42) in terms of hospitality. This leads us most immediately to Martha the anxious hostess and to noticing the Lord's tenderness towards her despite his unwillingness to intervene in the drama between the sisters--as he gently points out to her that the injustice she perceives outside of herself is really within. What a fine meditation this gospel might be for those who dismiss God because he doesn't intervene in the world in the way they imagine he should! But a reflection on hospitality also brings us to Mary, who is also receiving the Lord by making herself a disciple who sits listening at his feet. She teaches us that prayer, adoration, and the love of God are acts of hospitality, of graciously receiving the presence of Jesus Christ. A merely human religiosity can see prayer as an addressing of ourselves to a deity somewhere up in the sky, either literally or in some rarefied sky more palatable to persons imbued with modern science. We pray to this god either in the hopes of manipulating him for our purposes, which is magic, or to try to squeeze benefits and graces from his apparent stinginess. The good news of Christian faith is that it turns all of the unwisdom of such human theological imagination on its head. From the call of Abraham to the Resurrection appearances, Christian faith speaks of a God who arrives, who is adventitious. He is not a supreme being who must be pulled down from the sky or a cthonic power that must be conjured up from the netherworld. Rather, he is a Presence discovered, sometimes as a surprise, as with Abraham and the three men, or simply recognized precisely when he calls us by name, as with the Risen Lord and Mary Magdalene. Prayer and adoration, then, as the postures that make us disciples of Jesus Christ, are acts of hospitality, of graciously receiving the Presence of God as he arrives in the particular circumstances of our days. A similar teaching comes to us in the parable of the wise and foolish virgins (Matthew 25:1-13). The Bridegroom is always arriving in our lives, of course, because he lives in transcendent eternity. But it is only by allowing our souls to be lit up by the burning oil of prayer that we come to notice his arrival and know to make space, to graciously receive him. In the summer of 2002 I emerged from the former Capuchin novitiate in Mt. Calvary, Wisconsin and moved to Boston to become a student at the former Weston Jesuit School of Theology. (How passing are the things of this world!) In various senses I was at an impressionable moment, and this turned out to be a good thing because my ideas of the Catholic faith at the time were somewhat random, spotty, and unbalanced, the result of some years spent in solitary reflection, undisciplined reading, and uneven use of pastoral care and spiritual direction. I was very much ready for the good teachers that I had at Weston. Each time the parable of the Good Samaritan rolls around in the lectionary, as it does today in the Sunday cycle, I think of one of those teachers, the professor I had for Moral Theology 101. One of his things, which he returned to a couple of times during the semester, was that the tradition had always seen the Good Samaritan as more of a Christological allegory than a moral example, and perhaps we would do well to preach it that way. I took the advice and have always done so, more or less, up to and including today. Trying to give homilies with my little bit of Italian, I have stuck close to some of my familiar approaches, at least so far. This scholar of the law had one of the great privileges of all of human history, to have the Lord himself say to him, 'You have answered correctly.' And yet, in that little shift into the self in his final question, he made a spiritual wrong turn. Everything he had said before that turned him outwards, loving God with all his heart, being, strength, and mind, and his neighbor as himself. But wishing to justify himself, it got turned around, twisted back, and he became the homo incurvatus, the human being bent over into himself. It's tempting to take the easy way out of this ever-present danger of religion and say 'God is other people,' forgetting the simultaneous truth of 'God is other, people,' as teaches the oft-repeated anecdote about Avery Dulles, may he rest in peace. The transcendence of God pushes us inside, to the mind, the soul, the spiritual parts of our created being that resemble most the being of God. In this sense a spiritual life can't be lived without some reflection on one's own self, examination of conscience, discernments and resolutions aimed, on the one hand, at living better the obligations of the state of life to which we are called, and on the other, staying out of sin, especially mortal sin. But this sometimes slips from its rightful context of the love of God such that our religion turns into a sort of lease between ourselves and the Landlord, who is happy to let us live comfortably (and in bad cases, in presumption) in a 'state of grace' as long as we pay the rent of our good behavior. Our 'spirituality,' which is supposed to inspire us to abandon and lose ourselves in God and his designs, goes into a sort of reverse, becoming a project of managing the interior safety and security of ourselves as pious persons. As if our salvation were something God offered with indifference, a 'take it or leave it,' instead of something he wills for us, and is just dying--literally--to give us! Also in the spiritual order people sometimes try to trade freedom for security, but these securities turn out to be illusory and ordered to misery. And the last miserable result is a soul ready for and resigned to hell because it's easier than surrender. Whatever you want to think about ad orientem as a liturgical tradition, you have to admit that it's a concept well-embedded in the critical vocabulary of Christian spirituality. "You entered to discern your adversary whom you thought to renounce and you turned toward the east [ad orientem]: for the one who renounces the devil, being converted to Christ, discerns Christ by a direct gaze." Conversion turns us around; after discerning the pointlessness and misery of the false promises of the world, the flesh, and the devil, we turn around and face east, toward the dawn of the new creation that is the Resurrection of Jesus Christ. Back when I was at the parish, one night I was locking up the church and a lady stopped me to say something. "You're a good priest, Father, but you're not pro-life enough." Today is the feast of St. Veronica Giuliani, Capuchin Poor Clare abbess and stigmatic (+1727). She's really one of the great characters of Capuchin history. A couple of times my current assignment has found me scanning a page from her diaries for someone, and I always remark on how much she wrote and that one of these days I should get around to reading it. At some moment or other here in Rome, I picked up a little booklet, 'The Rosary with St. Veronica Giuliani.' It's from Shalom, which publishes a lot of such helpful little things here in Italy. For each of the mysteries of the rosary, it has the corresponding passage of Sacred Scripture and then a text from St. Veronica's diaries. I've been praying my rosary with the booklet for a few months now. The texts are simple, but striking. Here are some examples. "While I was looking at the Baby in the nativity scene, it seemed to me as if I saw him moving and giving me a look at he said: 'I am all for you.' And I said: 'I am all for you.' I would have wanted to give him anything. He said to me: 'I want your heart.'" "After Matins, there came to me a recollection in which there was a vision of our Lord's scourging at the pillar. I saw him bound to the pillar, all wounded. He said to me, 'Do you see where love has led me?'" "I seemed to be in a beautiful and spacious place and I felt a great desire to unite myself totally to God. Right away the Lord appeared, completely glorified, and he said to me: 'What do you want?' And I answered: 'I long for you alone, to give me everything according to your will.' At this point the Lord showed me his holy wounds and said to me: 'These are the keys and the doors for entering me.' Oh! What happiness, what joy try the soul when she has found the one for whom she was longing!" As a native speaker of English living in a foreign-language environment, one comes to have some compassion for those who would like to learn English or improve the English they have (because everyone has a little, whether they admit it or not), but find themselves frustrated by the difficulties of the language, e.g. elastic vowels, phrasal verbs, an immense vocabulary, etc. There are in circulation various pieces of verse that point out some of the eccentricities of the English language, making light and fun of them for the amusement of English speakers and the consolation of those who would like to join them. I'll explain how I came to be aware of this. For there is one God, and there is one mediator between God and men, the man Christ Jesus.